This course is designed for beginners and current hairdressers wishing to refresh and advance their skills. Your tutor will assess your level and adapt the course to suit you. 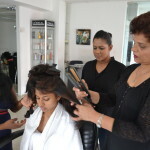 This advanced course will include demonstrations, and hands on workshop sessions incorporating the latest techniques, trends and cuts for updating your current abilities.